"Qual-Online The Essential Guide by Jennifer Dale and Susan Abbott"
The core skills required to be a good Qualitative Research Consultant (QRC) are the same for online qualitative as they are for in-person research. Clear research objectives, an effective screening questionnaire, an unbiased discussion guide and insightful analysis are the foundation of any good qualitative research study. If you are new to your career in qualitative research, learning how to do online qualitative is a foundational skill, as important as learning how to do in-person research. Learning at least some of these approaches is a stepping stone to the new tools that will continue to come along. If you’re a seasoned QRC, congratulations! 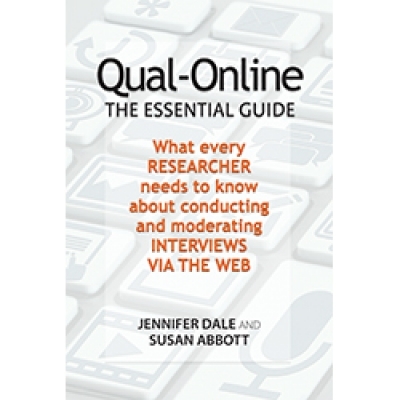 Whether you’ve ignored, dabbled-in, or fully embraced online qualitative research, this book will help you. From learning about the types of tools at your disposal, to planning your first online study, this extensive guide will help you understand the sequence of steps to follow, timing, and costs involved. It will also help you manage all of the useful insights you will gather--making your job of sharing information with your client that much easier and your reports that much more robust. Looking five years ahead, it seems obvious to us that most researchers will be offering their clients new ways and new approaches using online methods. Don’t be left behind with nothing to offer but old ideas and expensive pricing. Offering your clients the option of online qual is a way for you to welcome them into the future. This book will help you embrace the future with confidence. Make sure to click on the "Reviews" tab above to see what reviewers are saying about this ground-breaking book!